"Aren't you afraid of the witch?" asked Ferdinand. He thought of his plump little belly and wondered if the witch might just pop him in the oven right away without bothering to fatten him first with sweets. But this did not deter Nina. She reminded him that just last Halloween, she had been a witch herself. She would know how to handle any witch that came along. 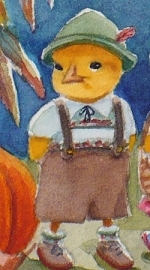 Ferdinand thought longingly of the white sheet with two holes cut out for eyes, but when he discovered that as Hansel he would have a nice green cap to wear with a red feather in it, he was persuaded. So with high hopes the pair set out as soon as the full moon had risen over Tulipa Farm. Nina brought a large basket for all the sweets they were sure to find. 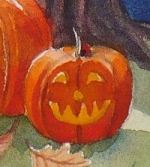 Through the dark and scary night with dry leaves rustling around their feet, past goblins and ghosts, black spiders, bats and frowning jack-o-lanterns, they walked unafraid in their quest for the Gingerbread House. Along the way, so as not to miss out on anything, they stopped at every barn and stable door, every pig pen and chicken coop to gather treats. 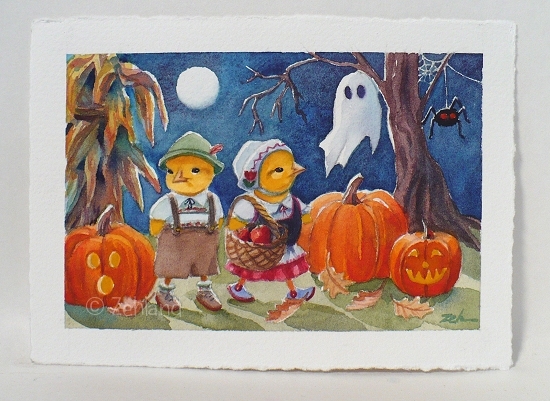 "Hansel and Gretel here we are. We would like a candy bar." They practiced this until it was fully memorized. However, whenever they were presented with goodies, they were so excited that all they could remember to say was "Yes please" and "Thank you". Every so often they said "Trick or Treat" as well. 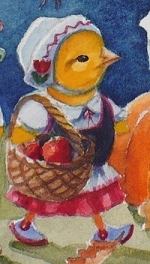 By the time Nina's basket was too full to hold any more candied berries, apples, seed cakes and dried fruit and was so heavy that Ferdinand had to help carry it, they were too tired to search for the gingerbread house. So they brought their treats home to divide between them. 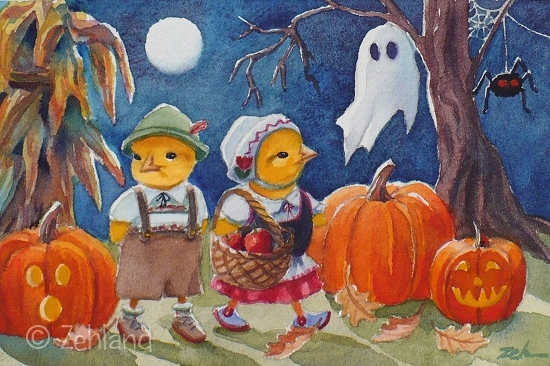 They finished off the night with their friends, bobbing for apples, telling spooky stories and eating lots of goodies until they could not eat any more and their little heads began to nod. Tucked into bed under the harvest moon, Nina dreamed of a house decorated with icing and cakes. 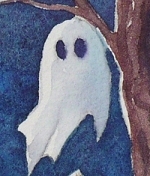 But Ferdinand, his tummy overfull with many sweets, dreamed of witches, goblins and ghosts!